Nineteenth century turbulence at home and abroad saw the re-emergence of the use of military pensioners that had been abandoned in the years immediately following the Napoleonic Wars. This played out in various ways around the Empire including WA’s experience with the Enrolled Pensioner Force: the largest and final force of military pensioners sent to the British Colonies. Over 61,000 veterans were receiving pensions by 1819. Potentially unruly or discontented former servicemen presented both a problem and a partial solution when arrangements for preserving public peace were inadequate. 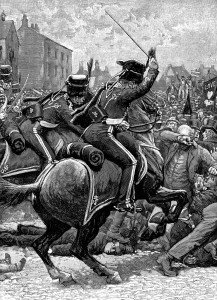 The ‘Peterloo Massacre’ in Manchester in 1819 caused a public outcry when poorly trained mounted yeomanry assaulted a crowd. British governments eventually decided that men with solid military experience were better options for law enforcement than enthusiastic amateurs. 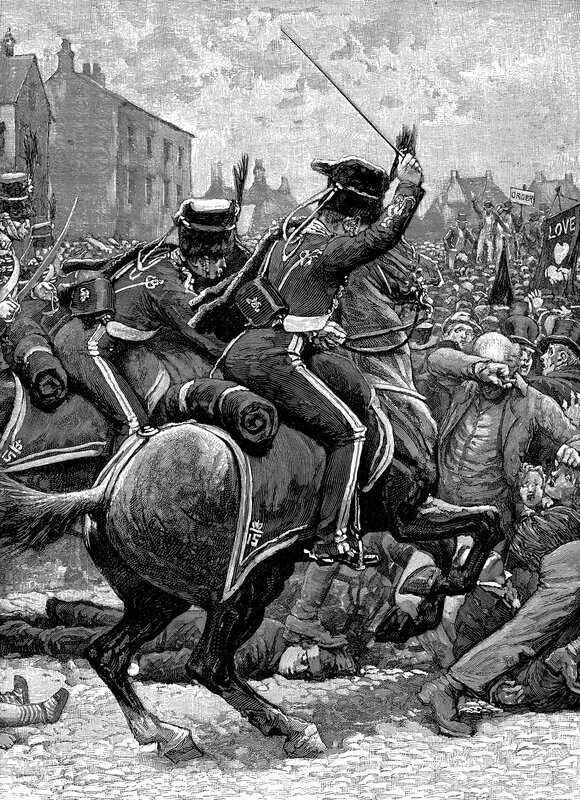 Then came the Luddite and Rebecca riots and the Chartist disturbances, which led to the conscription of many army veterans as special constables. This ad-hoc approach resulted in some unsatisfactory outcomes for the ill-equipped veterans. 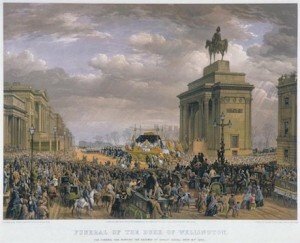 In 1843 the Government finally pushed through legislation allowing the raising of companies of out-pensioners to aid the civil power. Nearly 3,000 enrolled pensioners were issued with arms and uniforms in many cities during the 1840’s. The role of the pensioners expanded to include other civic trouble-shooting, such as special duty in the Tower of London in 1852 during the Duke of Wellington’s funeral. To sum up, the pensioners had been of much greater use operating in armed, disciplined, and uniformed companies than as special constables. They foreshadowed the creation of a more highly developed Police Force. In the late 1840’s financial constraints at Home led Lord Henry Grey (Secretary of State for War and the Colonies) to inform Governor General Lord Elgin that regular British Army units based in Canada would be reduced in number and that the locals needed to raise, arm and train more militia. Companies of enrolled pensioners could be used to help out in the period of transition as garrison troops and as a quasi-police establishment. Captain James Tulloch visited Canada in April 1849 to assess the feasibility of the scheme and to make recommendations. He suggested the despatch of pensioners to 12 locations in the west of Canada, with the proviso that the men should be given land grants near townships. All was agreed and a warrant authorised the recruiting of 1,000 veterans for service in Canada. With the arrival of the first draft in July 1851 the gradual withdrawal of British regulars began. By 1855 nearly two thirds of the regulars had left: pensioners’ companies were on permanent duty as special guards, garrison men, police and guards of honour on ceremonial occasions. At the same time the Canadians were in the process of raising and training large numbers of local militia. A report of April 1857 indicated all was going well. The provinces were moving towards a high degree of military self-reliance. On 31 October 1859 the pensioner companies were disbanded, but they were not forgotten. Their years of solid, efficient duty have been described as a turning point in Canada’s military evolution from colony to nation. Army pensioners in a reasonable state of health and who had finished their terms of service arrived in Tasmania as convict guards. They obtained small land grants in return for 12 days military service a year. They were also required to turn out in force to defend the colony in the event of invasion or rebellions. The first group of 63 men plus their families arrived in 1826-1827 and were placed among five settlements. A larger batch of 109 (along with 107 wives and children) turned up in 1832. The final contingent of 527 men (with 1,094 women and children) arrived from 1850 to 1856. The Tasmanian pensioners oversaw public works, supervised convicts and acted as mounted police on occasion. From 1851 onwards groups of them did duty on rotation on the Victorian Goldfields and some were involved in the Eureka Stockade incident. Their land grants sometimes fell on infertile ground. By the late 1850s about 103 men had left the colony (roughly one in seven) and more drifted away in the following years. There is no need to draw particularly negative conclusions about the tendency to seek greener pastures. Enrolled pensioners were able to lead quite varied lives and, as the West Australian experience shows, were not strictly tied to their land allocations and had no trouble moving into occupations outside the confines of military life. They were free agents when they chose to be and could move from one colony to another with ease and continue to draw their pensions in the process. After the First Maori War ended Governor George Grey asked the London authorities to provide troops for long-term protection of settlers. The Government approved the forming of a corps consisting of army veterans – the Royal New Zealand Fencibles. The latter were raised for specific local defence and garrison duty and could not be transferred elsewhere. The Corps was to consist of veterans in good health and of decent character. Most of them had families to support. A total of 721 fencibles (plus about 1,800 family members) arrived between the years 1847-1852. They were settled in four villages just south of the main administrative centre of the colony, Auckland. They were Howick, Onehunga, Otahuhu and Panmure. The pensioners received a cottage, an acre of cleared land and farm equipment. They had to turn out for drill 12 days a year and attend an inspection parade every Sunday. On the plus side they could earn extra money as farm labourers and after serving seven years they got to keep their land and cottage. In 1851 the fencibles responded to an attack by Maoris and helped fend off an ‘armada’ of canoes in Mechanics Bay threatening Auckland. On this occasion peace was negotiated. When a major war broke out again, Auckland was once more under threat. All able-bodied teenagers and males up to the age of 65 were mustered for service in the militia. At least 75 former fencibles and their sons joined up. 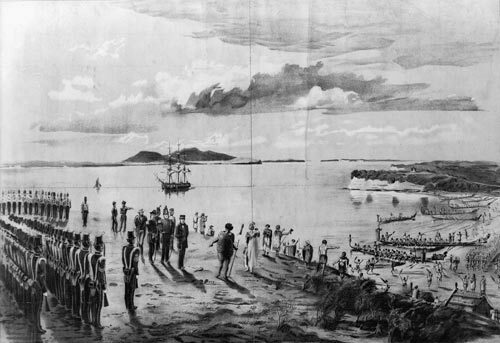 By 1864, the arrival of various British regiments and thousands of volunteers from the Australian colonies ended the crisis after months of hard fighting, although lower scale conflict continued for years. Veterans of the New Zealand Fencibles had done well by an emerging nation and the Corps is honoured to this day. The New Zealand Fencibles’ various roles and conditions of service resembled those of veteran counterparts in Canada and Tasmania and the Enrolled Pensioner Force in WA. The social gulf between officers and men, the obligation to muster regularly for drill, the Sunday parades, the cottages, the small plots of land, the opportunity to start new lives and so on reveal that the various colonial military pensioner establishments had much in common. Western Australia received the largest number. Their value as defenders of the colony was evident in 1865: pensioners at Camden Harbour deterred an attack by Asian maritime visitors engaged in slave raiding as well as unlawful fishing activity. Haythornthwaite, P.J. The Armies of Wellington, Arms and Armour Press, 1994. Brown, S. British Regiments and the men who led them: Royal Veteran reserve and garrison battalions. Mather, F.C. Army pensioners and the maintenance of civil order in early nineteenth century England, Journal of the Society for Army Historical Research. Steppler, G.A. Amateurs to Arms! Budding Books, Gloucestershire, 1997. Reilly, R. The British at the Gates, G.A.Putnam’s Sons, New York. Dube, T.D. A Force too small to imply constraint but sufficient to proclaim a principle. The Enrolled Pensioner Scheme in Canada West 1851-1858, (an online article, now no longer available, based on a 1982 Master-of-Arts thesis). Ring, M. Military Pensioners, in The Companion to Tasmanian History, ed. by Alexander, A. Centre for Tasmanian Historical Studies, University of Tasmania (online version, 2006). The Argus, December 7, 1849 – Military Pensioners (reprinted from the United Services Gazette, July 28, 1849). Cowan, J. The New Zealand Wars and the pioneering period, Vol.I, Government Printer, Wellington, 1922. Gibson, T. The Maori War, A.H. and A.W.Reed, Wellington, 1974. Taylor, N.E.Withnell Yeera-Muck-A-Do, Hesperian Press, Western Australia, 1987. This article first appeared in the EPG Gazette, Vol.17, No.2, with expanded narrative and footnotes.